Content: There’s some mild scary parts. It will be in the middle grade (grades 3-5) section of the bookstore. Elizabeth is an orphan (of course) living with her neglectful (of course) relatives when she (of course) gets a mysterious invitation to visit the Winterhouse hotel, a posh, somewhat charming (of course) hotel out in the middle of the country. Her aunt and uncle (of course) send her (they got a mysterious Christmas vacation out of it), glad (of course) to be rid of the Burden that she is. 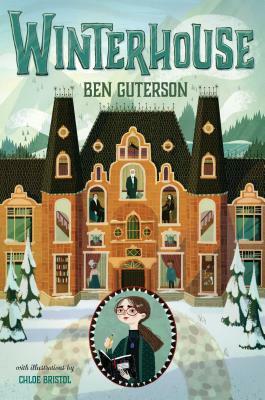 Once at Winterhouse, Elizabeth (of course) discovers the gigantic (of course) library, makes a friend in the genius inventor (of course) Freddy and the mysterious, eccentric (of course) owner Norbridge seems nice enough. There’s some other guests who are (of course) creepy, and a mystery looming which (of course) Elizabeth is drawn to solve. All those of courses kind of make it seem as if I didn’t like this one, except event though the plot/concept seemed really familiar, and Been There Done That, I still enjoyed the book. I liked the puzzles that Freddy and Elizabeth solve. I liked the mysterious codes and word games that they played. I thought the ghost story was a bit much, but it didn’t bother me overly much. Maybe the story was a bit trite but Guterson knows how to engage a reader, and keep the pages turning. Which is possibly all a story really needs.